The RailDriver® division of P.I. Engineering launched in July 2002 with the purpose of providing train cab controls that would be capable of running most train simulation programs. Headed up by a train fanatic, and backed by a team of like-minded railroad aficionados, RailDriver® was created, and the division released the Desktop Train Cab Controller in December of 2002. Given that Microsoft Train Simulator had no provision for hardware connection and no mechanism in place to provide feedback to hardware, this was no small feat. 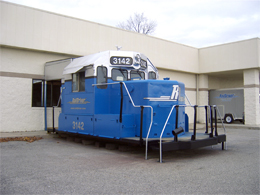 The engineering team designed a method of capturing the 'Heads Up Display' from the screen and using Optical Character Recognition to read speed, brake pressure, and lever position and feed it to the RailDriver®. RailDriver® remains dedicated to the train simulation community and is always making every effort to support both current and future train simulation programs with prototypical hardware, in order to provide the most immersive train experience possible. RailDriver® is a division of P.I. Engineering, a worldwide expert in computer input hardware, makers of X-keys® programmable keyboards, Y-mouse® computer adapters, and ReDAC™ Real World Display and Control hardware for full-sized simulation applications. RailDriver® and P.I. Engineering are headquartered in Williamston, MI, just a stone's throw south of the CSX line (formerly Pere Marquette).